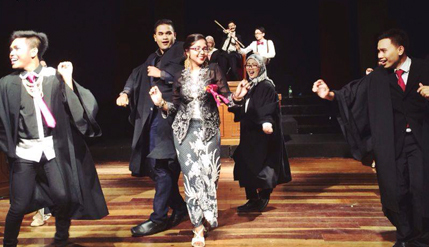 BANGI, 30 Apr 2014 – A musical play staged recently by The National University of Malaysia’s (UKM) Law Faculty Students Association in the form of a Mock Trial titledMannequin has been a resounding success. The Mock Trial with the story line of a fictitious trial was to narrate the proceedings of a court case including how the prosecution and the defense were carried out. This was the second such theatre musical held following a similar play held for the first time last year. Director of the play, Mohd Amierul Sharafi, said those behind the production had thought about it for some eight months. The UKM Mock Trial 2014 had taken a leaf from similar mock trials undertaken by law students in other universities like University Malaya (UM) and University Technology MARA (UiTM). Mannequin was chosen as this year Mock Trial subject to build up public curiosity about a court case so as to attract people to attend. The play was about a gruesome murder of an exclusive boutique owner Misha, with her business partner who was also her lover, Dato’ Saat bin Talib as the main suspect. The latter was charged with first degree murder for hitting the victim’s head with a blunt object being the arm of a mannequin. The comedy-themed play was undertaken by the 30 member committee with the cast made up entirely of law students who do not have any acting training or experience but were chosen after an audition. The event was sponsored by 10 companies including Legend Venture as the main sponsor. Legend Venture was also the main sponsor for the 2013 Mock Trial musical entitled Cendol. The musical had a full house on its first night with all the 900 tickets being sold out within 5 hours of being offered even though it was promoted mainly through the social media networks such as Facebook, Twitter and Youtube. Tickets were also sold at other universities. The play was held at Panggung Seni, UKM for three consecutively days from the 18th to 20th April.